Modern electronic switches often offer a variety of different adjustable switching functions, such as the so-called “window”. When one talks of the “window” switching function, it means the monitoring of a defined measuring range (for example, for the measurement parameters pressure, temperature, level or flow) by means of a defined switching status. Generally, in most applications, a switch fulfills a monitoring or a safety function. In the past, switches were frequently used for the monitoring of a critical threshold value, e.g. safety shutdown on overtemperature, level too high, etc. However, this was also due to the fact that mechanical switches were limited by the hysteresis switching function. Electronic switches, however, nowadays offer a variety of different adjustable switching functions, such as the so-called “window” switching function. The “window” switching function enables a defined, fixed range to be monitored (such as temperature lying between 30 and 40 °C or level lying between 55 and 85 cm) and with a clearly defined switching status (e.g. within the window, the switching status = “open”) the control system can be signalled with a good/bad status. Let´s illustrate this with a practical example: In an apartment block, a pressure switch monitors a pressure booster system for the drinking water supply consisting of three pumps. The booster set should work within a “window”, or a pressure range, of 4 to 5 bar to ensure a supply with sufficient water pressure to the highest floor, but also to prevent any leakage or a pipe bursting due to overpressure. Within this window, the switching output should be active (e.g. switching output = “closed”), whereas above or below the window’s boundaries, it should be signaled by an inactive switching output (see fig.). 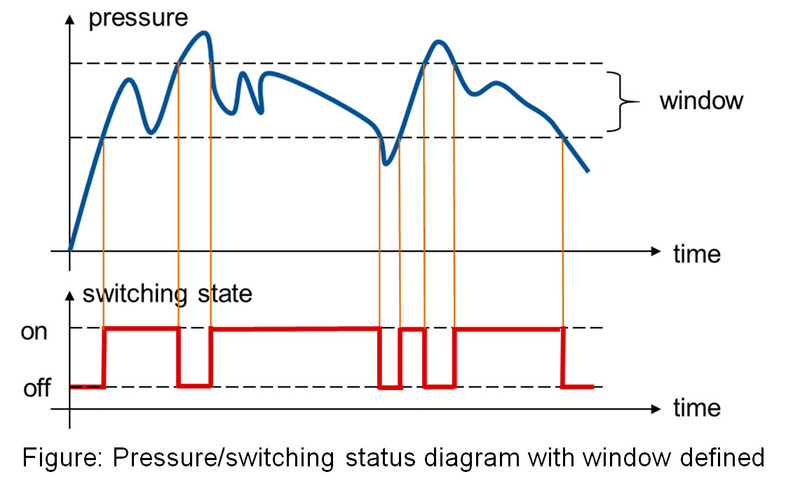 The “window” switching function also represents a safety function or monitoring function. Switches with the “window” switching function are always used when both exceeding as well as dropping below the monitored function should be detected and should lead to an action or the stopping of the system. In contrast to hysteresis, the “window” switching function monitors two limit values rather than just the one, an upper and a lower threshold (called the “window – high” and “window – low”). Electronic switches generally offer a freely definable “window” over almost the entire measuring range and can be configured via external software or a configuration module, or via an integrated display with control keys. 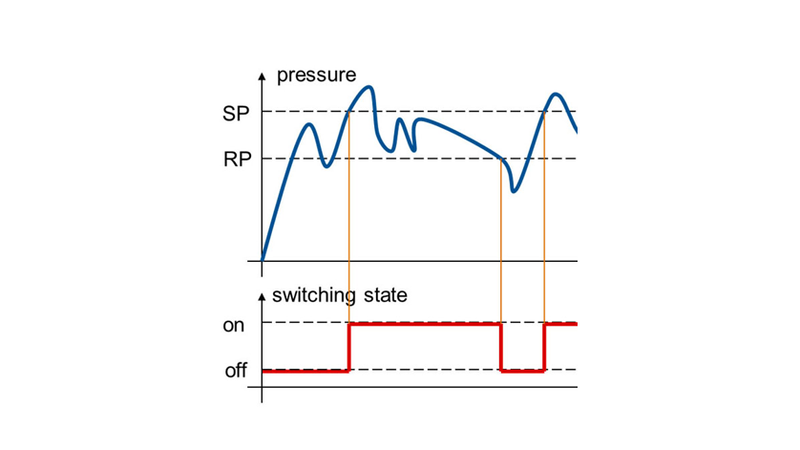 To date, however, hysteresis remains the most widely used switching function for monitoring critical limits. Your contact person will be glad to assist you with selecting an appropriate pressure switch.